See who ranks among The 25 Best Online Master’s in Higher Education Degree Programs! Earning a master’s degree in higher education and student affairs online allows graduates to pursue high-paying work as academic deans and provosts. Both of these positions earn an average yearly salary above $90,000, according to data from PayScale. Additionally, the Bureau of Labor Statistics (BLS) projects a 10% increase in the field of postsecondary administration over the next several years. By 2026, a projected 18,200 new positions will be created. This degree promotes career advancement, preparing graduates to work with college students in many roles, including as academic coaches, financial aid coordinators, and enrollment specialists. What Else Can I Expect From an Online Master’s in Higher Education Program? University of Central Florida ranks #1 on The 25 Best Online Master’s in Higher Education Degree Programs! With a main campus in Orlando and 12 satellite locations across the state, UCF also offers more than 80 degrees and certificates online, including specialized graduate programs in applied learning and instruction, career and technical education, exceptional student education, and educational leadership. Among these offerings is the master’s in higher education online. UCF’s master of arts in educational leadership program takes a global approach to non-teaching roles in the field of education. The 39-credit program includes a track in higher education/student personnel, encompassing advanced coursework in ethical and legal issues in college student personnel, organization and administration of higher education, and retention strategies in colleges and universities. Students must complete a combination of core, specialization, and elective courses, as well as an internship and practicum. The program culminates with a required capstone seminar. The MA in educational leadership at UCF does not lead to teaching certification. Graduates qualify for non-licensed jobs in education, and they often pursue careers as museum administrators, private school headmasters, directors of zoos and environmental centers, state department employees, and business HR administrators. State regulations prevent UCF from offering the online MA in educational leadership to students residing in Alabama, Arkansas, Iowa, Maryland, Massachusetts, and Minnesota. Online learners complete online coursework through Blackboard. Students enrolled in UCF receive access to the same academic and technical support as on-campus students, including tutoring, library, and career services. Students may enroll in the fall semester only. Applicants must submit GRE scores from within the last five years. UCF is regionally accredited by the Southern Association of Colleges and Schools Commission on Colleges (SACSCOC). Pennsylvania State University ranks #2 on The 25 Best Online Master’s in Higher Education Degree Programs! Penn State serves nearly 100,000 students through hundreds of academic programs, delivered across 24 Pennsylvania campuses and online. Students can complete more than 150 degrees and certificates online through Penn State’s World Campus, including a nationally recognized higher education master’s program. Penn State’s master’s degree in higher education prepares graduates for administrative jobs in higher education institutions. Coursework centers on building professional skills in enrollment management, institutional research, planning, and advising specifically for college-aged clientele. Graduates often pursue entry- to mid-level careers in college and university administration and other non-teaching positions in higher education. Penn State’s M.Ed. in higher education requires 30 credits of higher education, elective, and focus area coursework. Students build a foundation in higher education and student affairs, and explore critical administrative, legal, and planning and resource management issues in higher education. The program offers the choice of one of four emphasis areas: administration, student engagement, institutional research, or philanthropic leadership. Though not required, students may complete an internship in higher education. All students must complete a capstone project in order to graduate. Online learners access courses through the Blackboard platform. Students complete the majority of assignments asynchronously, with courses lasting 12–15 weeks. Benefits of online learning at Penn State include membership in the school’s chapter of the National Honor Society and the Penn State Alumni Association. The school requires applicants to hold a bachelor’s degree from a regionally accredited institution and submit GRE, GMAT, LSAT, or MAT scores. Applicants do not need prior work experience in higher education to apply. Penn State is regionally accredited by the Middle States Commission on Higher Education (MSCHE). University of Nebraska - Lincoln ranks #3 on The 25 Best Online Master’s in Higher Education Degree Programs! Chartered in 1869 as a public land-grant institution, the University of Nebraska-Lincoln maintains membership in the Big Ten Conference and the Big Ten Academic Alliance, in addition to receiving R1 Carnegie classification status. The university offers dozens of degrees and certificates across 10 academic colleges, serving a student enrollment of more than 25,000. The school helped pioneer distance education more than 100 years ago; today, the university offers over 25 bachelor’s, master’s, and doctoral degrees online. The University of Nebraska-Lincoln’s master of arts in educational administration features a focus in higher education administration, intended for professionals already working in higher education who seek an advanced administration career. The program comprises 30 credits in topics including higher education environments, personnel management, college students in America, and administrative theory. Graduates qualify for advanced positions in enrollment management, student engagement, advising, and student affairs. Students in the master’s in higher education online program complete coursework through Blackboard. Though some exceptions apply, most courses offer asynchronous assignments. Part-time students can complete the degree in four semesters and two summer sessions. The university also offers certificates in administration and community college leadership online. Applicants must hold a bachelor’s degree from a regionally accredited college or university, or an equivalent degree, or hold senior standing within nine hours of graduation from a University of Nebraska-Lincoln program. The University of Nebraska-Lincoln is regionally accredited by the Higher Learning Commission (HLC). Texas Tech University ranks #4 on The 25 Best Online Master’s in Higher Education Degree Programs! Established in 1923 as Texas Technological College, TTU claims rank as Texas' only campus housing not only a major university, but also fully functional medical and law schools. TTU boasts a student enrollment of more than 37,000, including 40 Goldwater Scholars and 34 Fulbright finalists over the last decade. The university offers more than 300 academic degrees and programs. TTU’s online master of education in higher education caters to experienced mid-level education administrators looking to advance their careers. The 36-credit program emphasizes hands-on experience at a local higher education institution in addition to online coursework covering higher education resource design, college student development, and access and equity in higher education. Students must complete an internship in higher education and conclude the degree with a master’s capstone project in lieu of a thesis. Coursework follows a preset cohort model, promoting a collaborative, team-oriented online learning environment. Graduates of the higher education master’s program at TTU qualify for mid- to upper-level careers in management and leadership within the administration of a college or university. Applicants must attend a one-day orientation on TTU’s main campus in Lubbock prior to the first semester of the program. The school does not accept transfer credits toward the M.Ed. degree. Most learners complete the degree in two years, taking six hours each fall, spring, and summer term. Online students complete courses both asynchronously and synchronously through the Blackboard platform. Student cohort meetings and synchronous sessions take place in the evenings, in central standard time. Texas Tech is regionally accredited by the Southern Association of Colleges and Schools Commission on Colleges (SACSCOC). Michigan State University ranks #5 on The 25 Best Online Master’s in Higher Education Degree Programs! The nation’s prototype land-grant university, MSU remains among the world’s top research universities, and hosts one of the nation’s largest and most eco-friendly campuses. The school boasts 44 Goldwater Scholars and 18 Rhodes Scholars among a student enrollment of more than 50,000. MSU features more than 200 academic programs from 17 degree-granting colleges on campus, and over 130 online, blended, and off-campus programs. MSU’s master of arts in higher, adult, and lifelong education promotes career advancement for educators and administrators currently employed in colleges and universities, private agencies, and nonprofit organizations. The 30-credit program combines core and elective courses in budget and finance, higher education policy, and curriculum development. In addition to building professional skills, students learn to serve students in diverse non-higher-learning capacities and contexts. Students conclude the degree with a culminating final portfolio project, combining the program’s theoretical and practical coursework. Graduates of MSU’s online master’s degree in higher education administration qualify for non-licensed jobs in higher education. Most part-time students complete the program in three years, while full-time students can complete it in as little as two years; all students must complete the degree requirements within five years. Online students complete MSU coursework through the D2L platform. Students enrolled in the online master’s degree in higher education administration program can access the MSU writing center, tech support, and additional academic resources through the Graduate Life and Wellness Center. University of Rochester ranks #6 on The 25 Best Online Master’s in Higher Education Degree Programs! Among the top research institutions in the U.S., the University of Rochester serves a student enrollment of 10,000 through more than 200 academic majors, across seven schools and colleges. The school offers intimate class sizes and personalized attention from instructors, maintaining a low student-teacher ratio of just 10–1. Rochester’s MS in educational administration features a specialization in higher education. The 36-credit master’s in higher education online combines required core, specialization, and elective courses, including a supervised internship in higher education. To conclude the degree, students must complete a culminating experience, consisting of either a master’s paper or culminating exam. While the degree does not lead to licensure, students looking to pursue certification independently may earn the MS as a stepping stone on the path to certification. Concentration coursework in Rochester’s online MS degree in educational administration examines theory and policy in the context of higher education. Courses explore topics including fiscal and contemporary issues in higher education, human capital management, student affairs administration, and technology in higher education. While the program offers some courses on a limited schedule, students may enroll in either the fall or spring semester to begin coursework. Online students access coursework through Blackboard. Learners complete assignments asynchronously, assisted by tech support, writing labs, virtual tutoring, and career services online. Rochester is regionally accredited by the Middle States Commission on Higher Education (MSCHE). Stony Brook University ranks #7 on The 25 Best Online Master’s in Higher Education Degree Programs! Spanning more than 1,000 acres on Long Island’s north shore, Stony Brook sits just 60 miles east of New York City. Stony Brook’s nearly 26,000 students can choose from 64 majors spanning the university’s 13 academic schools and colleges. Stony Brook’s professional development school offers a MA in higher education administration online, combining theoretical and practical higher education coursework aligned with American College Personnel Association and National Association of Student Personnel Administrators competencies. Students may pursue full- or part-time enrollment in the 36-credit program. The master’s degree in higher education and student affairs online suits students aspiring to work directly with students or in a service-related position within a college or university. The curriculum combines core and elective courses, culminating in a project seminar. Though not mandatory, students may choose a practicum or advanced practicum to fulfill an elective requirement. Students can complete Stony Brook’s online master’s in higher education in 16 months. Learners may elect to combine on-campus and online study in a hybrid format, or complete the degree entirely online. Courses explore topics including foundations of higher education administration and survey of college student development theory. Online students complete courses asynchronously through Blackboard. Students enrolled in the online master’s degree in higher education can access student resources including the writing center, library, disability support services, and tech support. Stony Brook is regionally accredited by the Middle States Commission on Higher Education (MSCHE). Appalachian State University ranks #8 on The 25 Best Online Master’s in Higher Education Degree Programs! Situated among North Carolina’s picturesque Blue Ridge Mountains, Appalachian State University promotes inclusion, diversity, and sustainable living among its student enrollment of more than 19,000. The school offers roughly 150 degrees, including more than 35 online bachelor’s, master’s, and doctoral degrees and certificates. Appalachian State University’s online higher education master’s program emphasizes methods of promoting student growth and retention within a college environment from a variety of professional perspectives. The MA in higher education offers a track in community college and university leadership to accommodate aspiring higher education administrators. The 36-hour program comprises required courses and concentration requirements, and allows students to choose either a thesis or non-thesis pathway. All students must pass a comprehensive written exam in order to graduate. Applicants to the online master’s degree in higher education at Appalachian State must hold a bachelor’s degree from an accredited university and submit GRE or MAT scores from within the last five years. Graduates often pursue upper-level careers within college or university administration, as well as jobs in business administration, fundraising, staff management, and academic advising. Online students complete MA coursework both synchronously and asynchronously through the Zoom and ASULearn platforms. Students must begin the program in the fall semester. The program follows a cohort-based part-time schedule that may involve blended or hybrid study. Appalachian is regionally accredited by the Southern Association of Colleges and Schools Commission on Colleges (SACSCOC). University of Houston ranks #9 on The 25 Best Online Master’s in Higher Education Degree Programs! Established in 1927, UH’s expansive campus serves a student enrollment of more than 45,000 in over 250 undergraduate, graduate, and post-graduate programs, including 24 master’s programs available entirely online. UH’s online M.Ed. in higher education adheres to the standards of the Council for the Advancement of Standards in Higher Education and the Association for the Study of Higher Education. The 36-credit program covers critical higher education competencies, including leadership for change, educational policy, and student development/student affairs. Students must complete a semester-long internship, accompanied by a three-hour course in experiential learning. Additionally, students take an elective course to explore their individual career goals. The online master’s degree in higher education administration at UH follows a cohort model that begins in the fall semester and typically takes students two years to complete. Students complete coursework through Blackboard, where they can also access tech support at all hours. Learners can communicate with professors through Skype, email, or by phone. Applicants must hold a bachelor’s degree from an accredited university with a GPA of 3.0 or better for admission into graduate programs offered by the school’s educational leadership and policy studies department. UH is regionally accredited by the Southern Association of Colleges and Schools Commission on Colleges (SACSCOC). Dallas Baptist University ranks #10 on The 25 Best Online Master’s in Higher Education Degree Programs! Established in 1898 as Texas' first two-year institution, DBU is a Baptist university that offers a variety of programs in liberal arts, science, and professional trades. The school offers over 100 undergraduate, master’s, and doctoral degrees — including more than 75 entirely online programs — to a student enrollment of more than 5,100. DBU’s online master of education in higher education allows students to choose between an administration track and an instructional track. Students in the administration track may additionally choose a concentration in community college leadership, interdisciplinary studies, distance learning, student affairs leadership, or leadership studies. The master’s degree in higher education online comprises 36 credits in core and concentration coursework, including a practicum in higher education and a biblical servant leadership course. Students interested in pursuing a certified teaching position within higher education can consider the instructional track with an optional instructional field concentration. The core curriculum in DBU’s M.Ed. in higher education explores history and philosophy, research methods, and legal aspects of the higher education system in the U.S. Students may pursue the M.Ed. concurrently with another program as part of DBU’s extensive dual degree options. Applicants must demonstrate an overall GPA of 3.2 or better, or a GPA of 3.5 or better in the last 60 hours of undergraduate coursework. Students with GPAs lower than the minimum requirement must also submit GRE scores. Learners may take classes online, in hybrid format, or on campus in the evening or on weekends. DBU is regionally accredited by the Southern Association of Colleges and Schools Commission on Colleges (SACSCOC). Louisiana State University ranks among The 25 Best Online Master’s in Higher Education Degree Programs! A land-grant, sea-grant, and space-grant university with a main campus in Baton Rouge and satellite locations across the state, LSU serves an enrollment of more than 31,000 through nearly 200 undergraduate, graduate, and professional degrees, including 10 distance programs in business, engineering, and human sciences and education available through LSU Online. LSU’s online master’s degree in higher education administration emphasizes the skills needed for administration and student affairs careers in higher education. The 36-credit program builds management and leadership competencies through coursework in recruiting, admissions, counseling, student support services, activities, and career placement and planning. Students must complete an internship in educational administration to earn the degree. The MA in education with a specialization in higher education administration at LSU takes full-time students 15 months to complete, though advisers typically recommend a completion time of 18–24 months. Each of the program’s 12 courses lasts for seven weeks. Students complete assignments through Moodle, where they can also access the LSU help desk and library resources for off-campus learners. Applicants must hold a bachelor’s degree from an accredited university and maintain a GPA of 3.0 or better. Students may also need to submit GRE scores, though applicants who meet the GPA requirement with at least two years of full-time experience in higher education/postsecondary work may waive the GRE requirement. LSU is regionally accredited by the Southern Association of Colleges and Schools Commission on Colleges (SACSCOC). University of Louisville ranks among The 25 Best Online Master’s in Higher Education Degree Programs! Located within Kentucky’s largest metropolitan city, UofL was established in 1798. The university occupies three campuses, a hospital, and a health sciences center, serving a student enrollment of over 22,000. UofL offers more than 200 degree programs spanning 12 academic colleges and schools, including 24 fully online degrees, certificates, and professional endorsements. UofL’s higher education master’s program addresses contemporary issues facing the leaders and administrators of colleges and universities in the U.S. Concentration options include administration, teaching and learning, and policy and equity. Students may enroll full- or part-time in the 36-credit program, comprising practice and advanced core courses combined with specialization coursework and a capstone project. Learners explore diversity in higher education, legal issues of postsecondary institutions, and higher education assessment, organization, and program development, culminating the degree with a required professional project. The program does not lead to licensure for postsecondary educators. Students access assignments through the Blackboard platform. They may complete some online courses in an eight-week accelerated format or through weekend intensives. Full-time learners may graduate in as little as two years. Applicants with a cumulative undergraduate GPA of 3.0 or better or a cumulative graduate GPA of 3.5 or better may waive the GRE requirement. Transfer students may apply up to six credits from an accredited college or university toward the degree. UofL is regionally accredited by the Southern Association of Colleges and Schools Commission on Colleges (SACSCOC). Sam Houston State University ranks among The 25 Best Online Master’s in Higher Education Degree Programs! Founded in 1879, SHSU upholds the legacy of its namesake, Texas' Sam Houston, a champion of public education in the state. The twelfth-largest university in Texas, SHSU is among the nation’s fastest-growing schools, recognized for its excellence in online programs and as a Carnegie-classified doctoral research institution. SHSU offers more than 170 fields of study and over 30 online programs to an enrollment of more than 20,000. SHSU’s master’s in higher education online emphasizes contemporary student affairs issues in the context of higher education. The MA in higher education administration comprises 30 credit hours. Students can also pursue a certificate in academic advising or higher education assessment and institutional research, in addition to the degree, through a 36-credit program. The program offers both a thesis and non-thesis option, the latter culminating in a practicum in higher education. The online master’s degree in higher education administration at SHSU explores enrollment management, student services and success, and governance or organization of college and university administration. Coursework also stresses professional functions of higher education administrators, including information technology and resource allocation skills. Students complete assignments online using Blackboard. Students may enroll in fall, spring, or summer semesters. Online learners can access advising services, including writing and math tutoring, library services, and tech support through the Academic Success Center. SHSU is regionally accredited by the Southern Association of Colleges and Schools Commission on Colleges (SACSCOC). 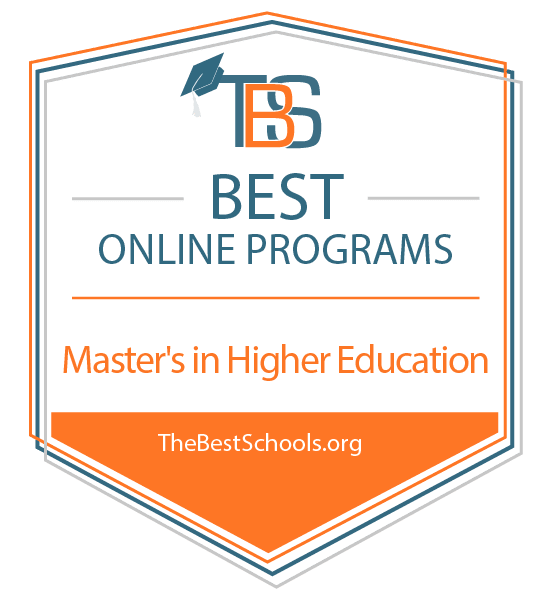 Georgia Southern University ranks among The 25 Best Online Master’s in Higher Education Degree Programs! Founded in 1906, Georgia Southern is the state’s largest and most comprehensive higher education institution south of Atlanta. The school serves an enrollment of more than 27,000 in its three campuses across the state, as well as online. Georgia Southern offers dozens of programs across nine academic colleges, including nearly 40 online degrees and certificates in business administration, education, health and human sciences, IT and engineering, liberal arts, and social sciences. Georgia Southern offers its online M.Ed. in higher education administration in a blended format. Students must complete 36 credits of higher education administration core, professional education core, and specialized content courses, culminating with a higher education practicum and the development of a professional portfolio. Coursework emphasizes the unique combination of student services, academic affairs, and business affairs skills required of higher education administrators. Students must complete assignments through a combination of asynchronous online and on-campus study in Statesboro. Learners may enroll full- or part-time in any semester. Graduates qualify for careers in alumni relations, athletics administration, institutional and policy research, and admissions and enrollment management. Applicants must demonstrate a cumulative GPA of 2.7 or better for all undergraduate and graduate work, and hold a bachelor’s degree from an accredited university. Students complete work online through the Georgia ONmyLINE portal, accessible to all distance learners in the Georgia university system. Georgia Southern is regionally accredited by the Southern Association of Colleges and Schools Commission on Colleges (SACSCOC). University of Wyoming ranks among The 25 Best Online Master’s in Higher Education Degree Programs! Located among the Rocky Mountains, UW hosts two campuses, in Laramie and Casper, in addition to several regional centers across the state and a sizable online department. Founded in 1886 as a land-grant research institution, the school offers 80 undergraduate and 90 graduate programs through seven academic colleges in subjects including life sciences, the arts and humanities, science and technology, and local industry. UW’s counseling, leadership, advocacy, and design school offers an online master’s degree in higher education administration. The MA features an emphasis in educational administration, adult and postsecondary education. The 33-credit program explores higher education systems, community college leadership, introduction to research, and planning and evaluation, culminating in a capstone course. Students complete coursework through a combination of online and blended study, with the exception of the capstone, which must be completed during the spring semester at the Laramie campus location. Applicants may take up to six credits of required MA courses at UW as a non-degree-seeking student, with any credits earned directly transferable to the degree upon acceptance into the program. Students must demonstrate a GPA of 3.0 or better and may apply at any time through UW’s rolling admissions process. Online learners complete courses through Blackboard. Online courses follow the same schedule, and offer the same student resources, as on-campus programs. UW boasts more than a century of experience in distance learning, as the first school west of Missouri to pioneer correspondence education. Mississippi College ranks among The 25 Best Online Master’s in Higher Education Degree Programs! Founded in 1826 in the tradition of the Mississippi Baptist Convention, MC claims rank as the state’s oldest institution of higher learning and largest private university. The school offers more than 100 liberal arts and sciences programs to an enrollment of more than 5,000. MC offers over 30 undergraduate and graduate degrees, and post-baccalaureate certificates online. MC’s online master’s degree in higher education administration combines theoretical concepts and practical skills in higher education. The master of science in higher education administration explores student development theories, law and finance in higher education, and basic effective leadership. Students must complete 27 credits of coursework along with two practicum experiences to earn the MS degree. Applicants must submit standardized test scores with their application to the MS degree. Students may transfer up to 65 hours from a regionally accredited community college — more if from a four-year university — from coursework completed with a grade of “C” or above. Online learners complete courses in the Moodle platform, with access to services including tutoring, career placement, and academic advising, through the Office of Student Success. Students may complete the online MS in higher education administration in 18 months. Enrollees may start classes in the spring, summer, or fall semester. MC is regionally accredited by the Southern Association of Colleges and Schools Commission on Colleges (SACSCOC). University of Mississippi ranks among The 25 Best Online Master’s in Higher Education Degree Programs! Founded in 1848, UM claims rank not only as Mississippi’s largest university, but also one of the nation’s fastest-growing institutions. The school boasts Carnegie R1 classification for its renowned programs across 12 academic institutes, and operates its own medical school, law school, and honors college. UM offers more than 40 majors, including 13 graduate degrees and certificates in business and education, and hundreds of courses available through Ole Miss Online. UM’s online MA in higher education program stresses a multi-disciplinary approach, integrating curriculum in human resources, student services, law, and finance. The 42-credit master’s degree in higher education online emphasizes both theoretical and practical mastery of the day-to-day functions of a higher education administrator, including career counseling, enrollment services, admissions, and financial aid. Students complete courses in educational research, organization and governance, and contemporary issues in higher education, including a student services practicum experience. Graduates often pursue positions such as student affairs administrator or co-curricular activities administrator. Applicants must hold a bachelor’s degree from a regionally accredited institution with an undergraduate GPA of 3.0 or better. Students must also submit GRE scores to be considered for admission. Online learners complete courses through Blackboard as part of a cohort group. Students may complete the majority of classes online, with the exception of a one-day orientation during the first summer semester that must be completed in person at UM’s Oxford campus. Online learners may take part in graduation services on campus. The degree typically takes two years to complete for students taking two classes at a time. All online students pay the same tuition, regardless of their state of residence. UM is regionally accredited by the Southern Association of Colleges Commission on Colleges (SACSCOC). Andrews University ranks among The 25 Best Online Master’s in Higher Education Degree Programs! Named for John Nevins Andrews, an influential figure from the 19th-century Seventh-day Adventist Church, Andrews University was founded in 1874. Located in Berrien Springs, Michigan, the school serves an enrollment of more than 3,300 through roughly 200 undergraduate and graduate degree options. Andrews' MA in higher education administration accompanies several higher education master’s programs and Ph.D. degrees offered through the Andrews' graduate studies school. The MA curriculum emphasizes a global focus in topics including corporate training, policy-making, and college-level research. The program provides students the opportunity to participate in a study-abroad experience in which they are able to observe operations of educators and administrators at higher learning institutions around the world. Graduates often pursue careers in student services, admissions, athletics, enrollment, and financial services. Students may apply in the fall, spring, or summer semester. Online learners typically complete the program in 2–3 years, though they may take up to four years to meet all degree requirements. Applicants must hold a bachelor’s degree from an accredited institution with a GPA of 2.6 or better. Andrews does not require applicants to submit GRE scores. Online learners complete courses asynchronously through LearningHub and can access several resources specifically for graduate students, including a help desk, orientation and study support, virtual tutoring, and transfer-friendly advising. Andrews is regionally accredited by the Higher Learning Commission (HLC). Southern New Hampshire University ranks among The 25 Best Online Master’s in Higher Education Degree Programs! Established in 1932 as a university dedicated to accounting and secretarial science, SNHU now offers over 200 programs in innovative disciplines in STEM, business, education, social sciences, and the liberal arts. The school serves an enrollment of more than 3,000 at its campuses in Manchester and Salem, as well as an online student body of over 90,000. SNHU’s online master’s degree in higher education administration takes a contemporary approach to higher education, emphasizing data-driven resource management, a culture of student success, and strategic leadership. The curriculum also builds a foundation in professional communication, organizational, leadership, and technical skills. The 36-credit program combines core and elective courses, culminating in a higher education capstone project. Students explore concepts including philosophy and history of higher education, program evaluation, enrollment management and marketing, and leading change in higher education. Applicants work closely with an admissions adviser to submit all necessary materials for the SNHU graduate application. Students may apply at any time due to the school’s rolling admissions schedule. Online learners may begin coursework in one of many available start dates throughout the spring, summer, and fall semesters. SNHU delivers its online courses for graduate programs in five, 10-week terms per year. Online students at SNHU can access the writing center, academic advising services, tech support, and career counseling through Online Education Services portal. SNHU is regionally accredited by the New England Association of Schools and Colleges (NEASC). Loyola University Chicago ranks among The 25 Best Online Master’s in Higher Education Degree Programs! From its flagship lakefront campus near downtown Chicago, Loyola serves an enrollment of more than 16,600 as the city’s premier Jesuit Catholic university. The school also hosts an international location in Rome, and plans to expand into the Illinois suburbs through a partnership with Trinity Health in Maywood. Loyola offers approximately 300 undergraduate, graduate, and professional programs and certificates through its 11 academic schools and colleges, including more than 20 programs available online. Loyola offers its higher education master’s programs with a uniquely global focus. The university combined its comparative international education and higher education and cultural and educational policy studies programs to offer the M.Ed. in international higher education. The 36-credit degree includes both online and blended courses, the latter requiring attendance at Loyola’s Rome campus, or at educational centers in Beijing or Ho Chi Minh City. Required coursework explores globalization and education, educating students abroad, and multiculturalism for social justice in higher education. The program also includes an international education internship and culminates with the development of an electronic portfolio through a capstone course. Applicants must submit transcripts demonstrating a GPA of 3.0 or better, three letters of recommendation, and a personal statement along with their graduate application. Students accepted into the master’s in higher education program may begin classes each fall term, and typically complete the degree in two years, including summer semesters. Online learners complete courses as part of a cohort group through the LOCUS platform. Online courses employ both fully online and blended formats; the school delivers some online courses asynchronously, while others may require synchronous sessions. Loyola is regionally accredited by the Higher Learning Commission (HLC). West Virginia University ranks among The 25 Best Online Master’s in Higher Education Degree Programs! Founded in 1867, WVU now hosts three unique campuses in Morgantown, Keyser, and Beckley, emphasizing innovative programs in research, the liberal arts, and technology. The public land-grant university boasts R1 Carnegie classification, as well as 25 Rhodes Scholars. WVU serves an enrollment of more than 31,000, primarily from its flagship Morgantown location, through over 340 academic majors and 14 colleges and schools. WVU’s online master’s degree in higher education administration offers customizable options to prepare students for executive- or administrative-level career advancement in academic support. The university’s education and human services college administers the degree. The 30-credit program encompasses required and elective courses, culminating in a capstone experience that includes an internship and portfolio development. Core coursework explores contemporary issues in higher education, introduction to research, and college student development. Applicants must hold a bachelor’s degree from an accredited college or university with a GPA of 3.0 or better and submit GRE scores in the 50th percentile or better. All WVU students pay the same tuition per credit, regardless of their geographical location. Online learners complete courses through Blackboard and can take advantage of enrollment coaching and academic advising online. Additional student support services include student-family resources and holistic health and well-being programs through WellWVU. WVU is regionally accredited by the Higher Learning Commission (HLC). Columbus State University ranks among The 25 Best Online Master’s in Higher Education Degree Programs! Established in 1958, CSU maintains a sprawling urban campus in downtown Columbus, 100 miles southwest of Atlanta, Georgia. Part of the University System of Georgia, CSU also includes the recently opened RiverPark campus in uptown Columbus and offers courses at Fort Benning in southern Georgia. CSU serves an enrollment of roughly 8,200 through dozens of degrees spanning seven academic schools and colleges. The M.Ed. in educational leadership includes a track in higher education. The 36-credit program encompasses professional core and concentration requirements, including an internship for school leadership. Courses explore higher education law and ethics, student development theory, introduction to student affairs, and school culture and diversity. The curriculum takes a practical approach to higher education administration career training, stressing advanced management, leadership, and problem-solving skills. Applicants must demonstrate a GPA of 2.7 or better and submit GRE scores for consideration. Qualified applicants for the M.Ed. in higher education program receive an invitation to attend a one-day, in-person interview with faculty on campus in Columbus. Online learners complete assignments through the CougarVIEW virtual learning system. Online courses follow the same semester schedule as on-campus classes. Students can access comprehensive online support resources, including library services, tech support, and financial aid counseling. CSU is regionally accredited by the Southern Association of Colleges and Schools Commission on Colleges (SACSCOC). Saint Cloud State University ranks among The 25 Best Online Master’s in Higher Education Degree Programs! Bordering the west bank of the Mississippi River, St. Cloud State maintains a 100-acre campus to house one of the largest public universities in Minnesota. The school offers more than 200 undergraduate and pre-professional programs, as well as more than 60 graduate programs. St. Cloud’s master’s in higher education online emphasizes the development of the academic and professional skills needed for entry-level positions in higher education administration. The curriculum also takes a global approach to higher education leadership. Graduates often pursue careers in student affairs and administration in domestic and international higher learning institutions. The 36-credit MS in higher education degree includes a practicum in a college or university near the student’s residence, and a culminating experience in the student’s choice of a thesis, comprehensive exam, or portfolio project. Learners may choose to take part in an optional study-abroad experience in Italy. Applicants must demonstrate a GPA of 2.7 or better, and submit three letters of recommendation and a statement of intent along with their application. Though not required, students may choose to submit GRE scores. Online learners taking three courses each fall and spring semester typically graduate in two years. St. Cloud students complete online courses both asynchronously and synchronously. The MS in higher education administration program follows a cohort model, with multiple options for students to study online, on campus, or in hybrid format. Cohort groups for the MS online begin in the fall semester each year. St. Cloud is regionally accredited by the Higher Learning Commission (HLC). University of New Orleans ranks among The 25 Best Online Master’s in Higher Education Degree Programs! Opened in 1958, UNO became the South’s first fully integrated public university. The school maintains its commitment to inclusion and diversity today, educating students from all 64 state parishes, all 50 U.S. states, and over 130 countries. An R1 Carnegie-classified research institution, UNO offers dozens of undergraduate, graduate, and pre-professional programs spanning nine schools and colleges, including several degrees available online. UNO’s master’s degree in higher education online targets multiple skill sets in educational leadership, including student affairs, assessment, and administration. The M.Ed. in higher education requires both online and on-campus courses, emphasizing a collaborative learning environment that prepares graduates for higher education administrator roles within urban and metropolitan colleges and universities. Students must complete 36 credits in foundations and leadership, professional practice, and electives courses and an internship to earn the degree. Coursework explores educational research, current issues in higher education, advanced education program evaluation, and higher education organization and leadership. Applicants must hold a bachelor’s degree from an accredited college or university. Though the program does not specify minimum requirements, applicants should submit official transcripts for all previous college coursework. Students accepted into the M.Ed. in higher education program typically complete the degree in two years, including summer terms. Online learners at UNO complete courses through the Moodle platform. Students can access support resources for online learning, including academic advising, success coaching, and disability services. UNO is regionally accredited by the Southern Association of Colleges and Schools Commission on Colleges (SACSCOC). University of Missouri - Kansas City ranks among The 25 Best Online Master’s in Higher Education Degree Programs! largest fully accredited university, UMKC is home to students from all 50 states and over 85 countries. The school serves an enrollment of roughly 16,700 through more than 175 academic programs for undergraduates, graduate students, and working professionals. UMKC’s education school facilitates the master’s degree in higher education online. The program emphasizes career skills for aspiring college or university administrators. Students in the MA in higher education administration program may choose from four optional concentrations: sports administration and exercise science, student affairs administration, foundations of higher education, or disability services. Though requirements vary, most students complete an internship as part of the degree. Candidates may pursue full- or part-time study, though most students pursue 6–9 credits per semester. The program requires a combination of online and on-campus evening classes. Applicants must submit a bachelor’s degree from an accredited institution with GPA of 3.0 or better. Students accepted into the master’s in higher education program must begin classes in the fall term. Full-time learners typically graduate in five semesters. Online learners complete courses through Blackboard and can access support tools including tutoring, counseling, advising, and career placement services online. Students may complete assignments through a combination of asynchronous, synchronous, blended, and strictly video streaming formats. UMKC is regionally accredited by the Higher Learning Commission (HLC). Typically ranging from 30–36 credits, higher education master’s programs take full-time students around two years to complete. Learners gain the skills needed to carry out administrative duties in a postsecondary setting. Common courses explore the history of higher education, current trends and issues faced by colleges, and laws governing higher education institutional practices and programs. In addition to completing core courses in areas such as enrollment management and higher education economics, students can pursue electives that prepare them for a specific career in higher education administration. Examples of potential elective course topics include community college administration, promoting inclusive learning environments, and theories of adult education. Potential students should check a program’s course offerings to ensure that the curriculum matches with their interests. As students near the end of their master’s in higher education online program, they often complete a culminating experience that consists of a research project, final paper, or portfolio. Some programs may include thesis or internship opportunities, although most students need not complete these experiences to earn their diplomas. Individuals who receive a master’s degree in higher education and student affairs online can pursue work in a variety of areas, including institutional research, human resources, and marketing. The adaptable nature of this degree allows students to advance at their current higher education careers or acquire an entry-level position in university administration. While program specifics vary from school to school, the curricula for most online master’s degree in higher education administration tracks feature many of the classes listed below. These courses familiarize students with topics frequently encountered by higher education professionals. Policy making in education: Students pursuing their master’s in higher education online acquire knowledge related to educational policy development. In this course, learners examine state and federal policies, legislation trends, and national college data research. Participants also learn how to develop new policies and determine the effectiveness of existing policies. Higher education economics and marketing: In this course, learners explore the many factors that influence the cost of college, who attends college, and the financial operations of a university. Participants become acquainted with the different marketing strategies used to attract new students and retain current enrollees. Knowledge of a university’s financial structure allows administrators to develop budgets, plan fundraisers, and improve organizational efficiency. Leadership and organizational change: In addition to providing students with the tools needed to quantify and interpret data, this course prepares individuals to work as change agents in higher education settings. Learners explore contemporary issues faced by colleges and gain communication and negotiation skills. Certified higher education professional: The CHEP credential, awarded by the Career Education Colleges and Universities trade organization, indicates that professionals hold expertise in areas such as online teaching, admissions, and/or campus operations. Eligible applicants must complete 48 hours of job training specific to their professional area. Certified career services provider: Issued by the National Career Development Association, this credential proves that individuals can successfully offer career services in an array of roles, such as consultants, advisers, and workforce practitioners. To be eligible for certification, candidates must complete the NCDA career development training program, which features online and face-to-face formats. The following occupations represent potential careers available to professionals who earn a master’s in higher education online. Higher education professionals possess strong communication and interpersonal skills, and their computer abilities allow them to navigate a school’s software programs. Additionally, the organizational scope of a college allows graduates in this field to work in a wide variety of areas. Postsecondary Education Administrators: Postsecondary education administrators play crucial roles in the operation of universities. These administrators may work in areas such as admissions, academic affairs, or the registrar’s office. Job duties vary depending on an administrator’s specialization, but graduates of an online master’s degree in higher education administration program commonly recruit students, determine scholarship eligibility, and advise students. Public Relations and Fundraising Managers: Approximately 20% of public relations and fundraising managers work in the education industry, and earning a master’s degree in higher education and student affairs online allows professionals to pursue many careers in a college environment. Graduates employed in this area may develop advertising strategies, write grants, and interact with donors to secure funding. Survey Researchers: These researchers develop surveys to gain information from specific populations. A survey researcher employed in a higher education setting may create surveys to assess retention, matriculation, or a student’s perception of their academic experience. Master’s in higher education online programs equip graduates with knowledge related to enrollment data collection and report writing. Accreditation is one of the most important variables to consider when selecting a program that offers a master’s degree in higher education and student affairs online. Accredited schools adhere to national standards, engage in equitable practices, and employ qualified faculty. Most U.S. colleges maintain regional accreditation, while less than a quarter hold national accreditation. Regional accreditation is generally viewed as the most prestigious form. Credits earned from schools with regional accreditation readily transfer to other regionally accredited universities. Alternatively, students who attend a nationally accredited school may not be able to apply credits toward degree requirements at a regionally accredited university. In addition to regional accreditation, students pursuing their master’s degree in higher education online may come across programs accredited by the Distance Education Accrediting Commission. This accrediting organization provides oversight for schools offering distance education programs. Another potential designation is program-specific accreditation. For example, higher education master’s programs that offer a concentration in career counseling may hold specialized accreditation from the Council for Accreditation of Counseling and Related Educational Programs. Students earning their master’s in higher education online gain access to numerous academic and career opportunities if they become members of a professional organization. Membership can lead to internships, entry-level positions, and peer support. Professional organizations frequently provide expansive job listings and helpful resume tips. Additionally, participation in conferences, webinars, and training events reinforces knowledge acquired in higher education master’s programs, and members of professional organizations often receive discounts on tuition for continuing education programs. American Association of Collegiate Registrars and Admissions Officers: With over 11,000 members, AACRAO helps professionals implement evidence-based practices that promote improved student services. This organization’s numerous resources cover topics that include enrollment management, transfer credit practices, and recruitment. NASPA - Student Affairs Administrators in Higher Education: This organization serves higher education professionals employed in areas such as residence life, enrollment services, and academic counseling. The organization’s focal areas include violence prevention, equity and diversity, and mental health support. Council for Advancement and Support of Education: A higher education organization geared toward marketing and communication professionals, CASE features more than 200 conferences and training programs every year, with topics in fundraising, alumni relations, and advancement services.